One of the brush strokes most often missing in beginners’ watercolor paintings is the Dry Brush Technique. This is a shame as it can add a great deal of energy and interest to a painting. While my comments are primarily directed at watercolor (watercolour) artists many of the points can also apply to dry brush technique for gouache, ink, oil and acrylic works of art – basically any fluid art medium. The dry brush painting stroke creates a range of broken edges implying neither hard nor soft edges. It can be used to create a statement but leaves enough uncertainty to allow the viewer to add some of their own interpretation to a painting while still getting the general message. Dry brush edges can add a great detail of variety to your painting. Some dry brush strokes can be hard edged on one side and broken on the other; something I find very useful when creating sparkle on water in seascapes and river paintings. They can be broken edged on both sides, a stroke I use when creating texture in clouds and on the sides of Venetian and other old buildings. By modifying the typical straight edged stroke to one with curves you can use it to quickly and easily create the impression of foliage in certain trees, like Australian gums, and fluffy clouds in the sky. A dry brush stroke can start on a portion of your watercolor paper which is dry and lead into a wet area acting as a nice connection between a textured region of ground moving towards a shadowed or more dense area. This stroke can also start from a wet area of your painting and be dragged into a dry one. 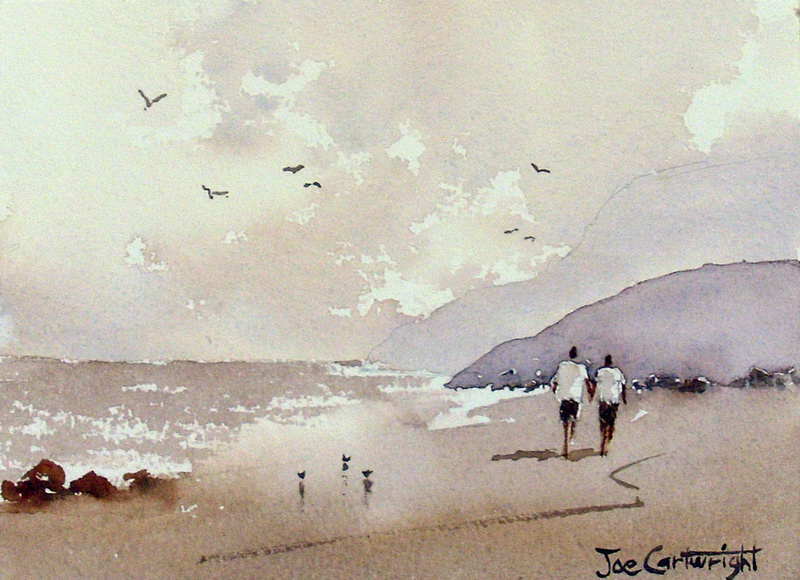 Quick dry brush strokes can be made to represent breaking waves in a beach scene or textured areas of a road surface. One stroke and you’re done; in my view, nothing conveys confidence in a watercolor painting more than dry brush strokes placed in just the right spot. 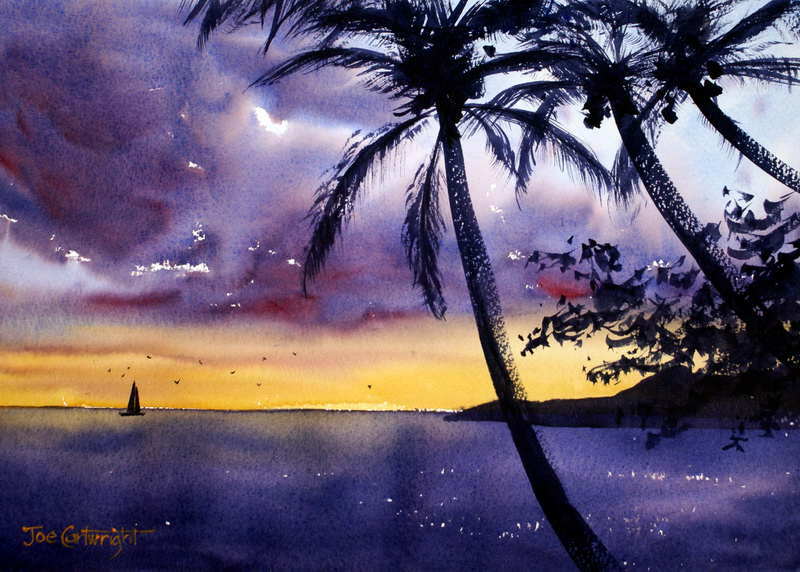 Another use of the dry brush technique is when painting palm trees, one quick stroke can create a trunk which has a hard edge on one side and a broken edge on the other. Figure 3: Dry brush technique to create palm tree trunks with one brush stroke. 1. The texture of your watercolor paper: is it rough, medium or smooth? It is much easier to create a dry brush stroke on rough paper, but it can be produced on any texture. 2. The speed of your brush movement determines how much of a dry brush effect you create: speed is more important the smoother the texture of your paper. If you are using very smooth paper you need to move the brush very fast to create this type of stroke. 3. How wet is the paper you are painting on? If your paper still has a shine on it then you cannot produce a dry brush stroke. It can only be produced on dry or maybe damp paper – though this requires a greater degree of skill as it can lead to a muddy work of art. 4. The angle of your brush and how hard you press: a brush held with the hairs parallel to your paper will create a different dry brush effect than one which uses the tip of your brush. The pressure you apply with also have an effect on your final dry brush result. 5. Finally the amount of watercolor paint as well as its consistency on your brush is important. This point works in conjunction with the points above. If you have a fully loaded (almost dripping) brush you have to move it quite fast to achieve a dry brush stroke. If you have less paint on the brush you may need to move the brush slower. If you are using smoother papers then you may need to reduce the amount of watercolor paint to get a creditable dry brush effect. Points 1 to 5 above are all interrelated. You can’t have a single rule for creating a dry brush stroke with watercolor because all five factors have to be taken into account along with what statement you are trying to make with a particular brush stroke. Remember you are not just coloring in when you paint a watercolor painting – you are making some statement and the various edges you create are part of your language! To me the most enjoyable watercolors are those that have the full range of watercolor artists’ painting edges within them. These edges include hard edged wet on dry strokes which imply definite statements effectively saying ‘Hey, this happens at just this spot in this way!” to soft wet on wet edges which leave a great deal up to the viewer to evaluate. The dry brush technique is equally as important as these other two brush techniques and including it in your work will help you create better and more interesting watercolor paintings.